Preheat your oven to 350 degrees. Mix all of the ingredients together except for the Parmesan and oregano. (I find that kneading it together with my hands is a bit messy, but it works the best.) Then roll out little pieces of the dough as thinly as possible on a lightly floured surface. Place the very thin dough in a single layer on a baking sheet covered with parchment paper. (This will make enough crackers to cover about 6 baking sheets, so we do them in a few separate batches.) 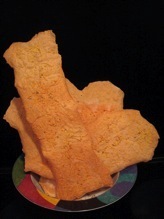 Sprinkle the crackers with a little grated Parmesan and dried oregano to taste. Bake for 12-18 minutes, depending on how thin you were able to make the crackers and depending on your oven. (Just watch them very closely because they are easy to burn.) They are done when they are golden and crispy. Few restaurants measure up, as they scream Gourmet!